Complete Guide to Submersible Pumps | GeoForm International, Inc.
How much do you know about submersible pumps? Since you’re reading this, we’re willing to bet that you know a little. As it turns out, there’s a lot more to know about these pumps than might initially meet the eye. They’re carefully constructed devices that have very specific tasks to perform — and they have a lot going on beneath the surface that you might not realize at first glance. Beyond this, submersible pumps are appropriate for use in a whole host of situations and settings that you might not have thought of. While you might be used to seeing and thinking of these pumps in one setting, it might never have occurred to you that you can use them for other purposes. Whatever your level of knowledge about these pumps, today we’re giving you our ultimate guide to submersible pumps. Whether you’re an absolute novice on the topic or you just need a quick brush-up on some of the details, we hope you can learn something interesting here. Just as the name implies, a submersible pump is one that is specifically designed to be submerged in the very liquid it is going to be pumping. This makes these pumps immensely practical, efficient and usable in a variety of applications. They can be used in numerous industrial and commercial applications as well as many homes, schools and businesses. How Did Submersible Pumps Originate? Submersible pumps were built and first appeared in Europe. They did not appear commonly in the U.S. until the 1950s. There were initial doubts about whether or not these pumps could be reliable, since they were fully submerged, but doubters were soon convinced and the submersible pump began to become more popular throughout the 1960s. The popularity of the pump continued to grow as more and more companies saw the benefits of its submersible capabilities. Today, they’re a valuable and irreplaceable part of many pumping stations and other applications. How Are Submersible Pumps Used? At GeoForm International, Inc., our submersible pumps power our entire line of equipment, from our dredges and aerators to our sewage digester packages. None of this equipment would run without the power of the submersible pump behind it. The basic idea of a submersible pump is that it can pump large amounts of liquid while fully submerged. This gives these pumps a large advantage over other types of pumps. Whether the machine in question is a dredge, an aerator or something else entirely, the submersible pump is the base technology. Each machine looks and operates differently, since they are equipped and outfitted as best suits their unique tasks and intended applications. But the basic functionality of each machine is based on the submersible pump. Because they can be used for so many applications, submersible pumps also come in a variety of sizes and capacities. The smaller models are more appropriate for home use and small-scale commercial applications, but there are also heavier models available. These larger pumps are typically used for industrial and construction applications. In addition to the submersible pump’s ability to work while entirely submerged in water, there are additional benefits that make this pump attractive for many different settings. One of these benefits is its ability to operate in areas with limited amounts of space. It’s also able to pump contaminated water that might damage other types of pumps, making it well-suited to more hazardous environments. Because the submersible pump is so versatile and durable, it might be tempting to assume it is equipped to handle any situation. However, this is not the case. One example of an inappropriate application for submersible pumps is any type of highly corrosive environment. If you use your pump in this type of setting, it may cause damage. Vertical pumps are highly powerful submersible pumps designed for situations where large quantities of clean fluid need to be moved. They’re powerful enough that they can get the job done even in situations where typical electric submersed pumps and large atmospheric centrifugal pumps would be ineffective. Because the applications for these pumps vary, they come in a variety of sizes. No matter the size, however, these pumps are designed to be extremely efficient at moving large amounts of fluid. Slurry pumps are designed to pump material that is a mixture of liquid and solid particles. This half-solidified material cannot be handled by most other pumps, so the slurry pump is usually employed to take care of it. It’s extremely effective in applications such as drainage and de-watering. These durable machines are often called into situations where the water or fluid that needs to be drained is too thick and sludgy for a typical vertical pump to manage. Like any heavy-duty tools or equipment, submersible pumps need to be operated with care. When handled correctly, they’re a wonderful tool and indispensable in many different industries. When handled incorrectly, however, they become a safety hazard and have the potential to cripple operations and hurt the people nearby. With this caution in mind, here is a brief list of some of the top do’s and don’ts regarding slurry pumps. Remember to always read any instructions and safety guides that come with your submersible pump before setting it up and operating it. Do make sure the pump is undamaged before using it. Do read all pertinent installation information and instructions. Don’t use the pump to pump hydrocarbons such as diesel, petrol and other fuel oils. Don’t operate the pump in any highly corrosive settings that might damage it. If you’re ever in doubt about how to operate, set up or care for your pump, always refer to any instructions or manuals that came with it. Submersible Pumps at GeoForm International, Inc. Here at GeoForm International, we understand that companies and industries across the globe depend on reliable and durable submersible pumps. That’s why we take our responsibility as manufacturers seriously. Our submersible pumps are carefully crafted with many industries in mind. We’re proud to distribute our top-notch hydraulic pumps to partners around the world and we’re passionate about creating products that can help your company reach its highest potential. That’s why submersible pumps are at the core of our international business operations. Our highest priority is crafting the finest pumps and distributing them to countries both near and far. Our Dino6 and Dino8 dredges are top-of-the-line pieces of equipment that wouldn’t be possible without the technology of the submersible pump. These Dino dredges are designed to remove sediment and sludge that has accumulated in a body of water. Essentially, both machines perform the same function. The only difference between them is that the Dino6 is a smaller machine while the Dino8 has double the power of its smaller counterpart. 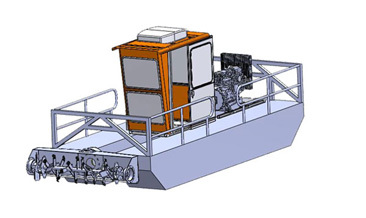 The Dino6 Dredge weighs in at 3,800 lbs., making it appropriate for small-scale dredging jobs in locations like golf courses, home association lakes, marinas and more. 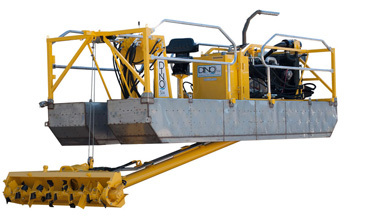 The Dino8, on the other hand, is far more powerful and is best used for mid-sized dredging projects. Submersible pumps are ultimately what power these Dino dredges, as they are submerged in the water and pump all the pieces of sediment. Because this type of work necessitates the pump being underwater, the submersible pump makes these dredges effective in a way no other type of pump technology could manage. 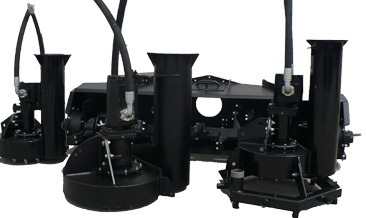 Our unique and customizable aerator works by using a hydraulic power source to fuel a wheel pump or a submersible pump. This pump is then dropped into a location to do its work. We offer two pump sizes depending on your needs so you can choose which is best for your project. The aerator is an excellent solution to many seasonal or emergency situations. In these tasks, some type of septic situation may cause damage to fish, vegetation and water. The aerator is used to help correct these situations. It also would not be possible without the technology of the submersible pump. The digester package is a solution to call in when the situation can’t be fixed by a small pump or drain. If ruined equipment, broken plumbing or some other type of blockage is clogging up a digester tank, it may be unable to be emptied from the bottom. In situations such as these, our pump can be lowered in from the top and will sink to the bottom of the tank. From there, it will pump straight back up into the truck. Again, this piece of equipment is available in multiple sizes depending on the scale of the project. At GeoForm International, we’re proud makers and manufacturers of the highest-quality submersible pumps. We not only create dependable and durable systems, but we also back them up with unparalleled customer service. If you have questions or concerns or want to talk to anyone at all about your submersible pump, we’re glad to assist you. It doesn’t matter if you’re from the agricultural industry, excavating industry, wastewater management industry or something else altogether. We consider you a valued customer and it’s important to us that you experience the very best in both the product you receive and the customer service you expect. If you have any questions about our products, don’t hesitate to reach out to us today on our website or give us a call at 913-782-1166.